Users often attach a NAS (Network Attached Storage) device or connect to a PC when using their android device. Although this then allows browsing of folders etc, there is no easy way to create playlists. 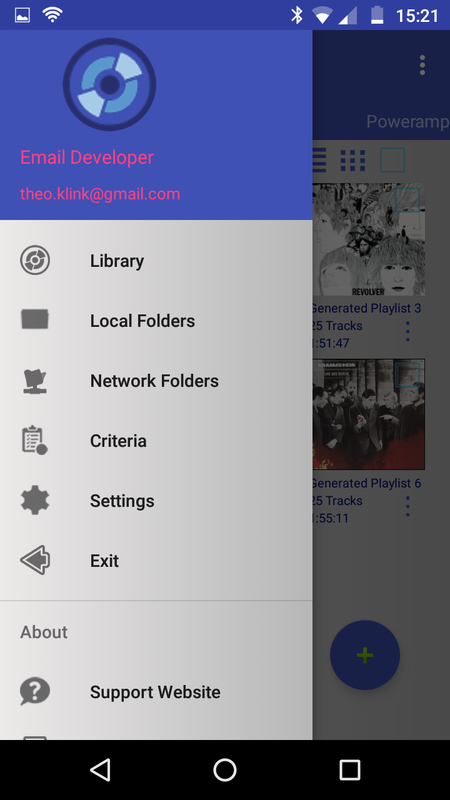 New Playlist Manager has functionality to allows you to create playlists whilst browsing the NAS or PC shares (aka smb or cifs shares) which can then be played with a suitable player. Xenoamp is an example of such a player. Select the Network Folders option on the main menu. Accessing this option for the very first time will ask you to provide your credentials for shared folder access. (If you do not know how to create shares on your PC or NAS please refer to its documentation or search for it on Google. Both "Share Name" and "IP" are mandatory fields. Depending on your security levels on the NAS or PC, the username and password may be empty but it is advised to use the login and password you normally use to access this folder. On entry into the "Set Share Name" field, a dialog box will launch showing you all the shares found on the particular server you specified with the ip addres. Simply select the appropriate folder and you will return to the main entry screen with the selected share name filled in. Finally, click OK and if all details are correct, the content of the share will be displayed. If you are unsuccessfull in connecting, an error message will indicate the possible reasons for failure. Browse through the folders to find your tracks. Long clicking on a track or folder will invoke the playlist dialog box. Single clicks on folders will navigate to the subfolders below if they exist. Unlike the Browse Local Folders, there is no recursive functionality so any subfolders with tracks will not be added, you simply navigate down to the lowest level and add folders whilst returning to the previous level. Return back up a folder tree by clicking the top folder showing the "../" prefix eg. The new smb playlists will be prefixed with smb_ and suffixed with .m3u. Spaces are replaced with underscores. For example My Playlist will become smb_My_Playlist.m3u. They are saved in the same playlist_manager folder which is also used for the regular .m3u exports. This detail includes the fully qualified pathname as well as the smb: protocol qualifier. You can play this type of playlist with a suitable player such as Xenoamp or Neutron or use a dlna server such as Minimserver on your pc and BubbleUnpnp on your device. 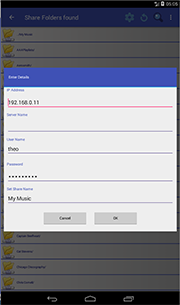 However, you may want to create playlists on your android device but play them using your NAS or PC. However, Pc's generally run the Windows Operating System which requires a different format. A number of options can be set under Settings in the section SMB M3U Export Settings. Note that the "\" is compliant with the Windows Operating system whereas the "/" is used in Unix/Android environments. These types of playlists can then be played on a PC using an appropriate player such as Foobar and Windows Media Player. There is also an option to replace the IP address with a server name, assuming this server name was provided when the details were entered. 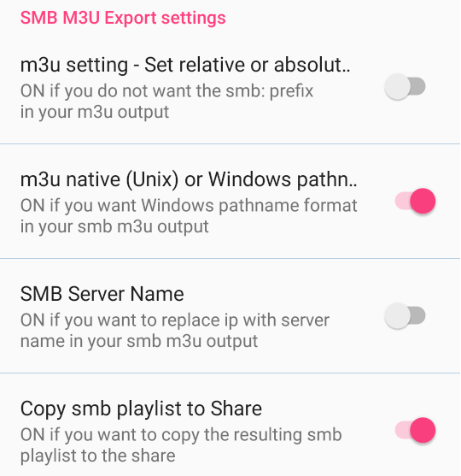 The option to copy the smb playlist to the share will create the smb playlist on your device in the playlst_manager folder but also attempt to copy to the share so that you can play the playlists immediately on your pc. You can manually copy these m3u playlists from the "Browse m3u Playlist" screen. Make sure you have the copy setting set to ON. An attempt will be made to connect automatically but you can also initiate this manually. If you wish to direct your smb playlists to an other or new folder, create a new folder. You automatically set the default too so that any smb playlists created, whilst browsing your share, will be saved here. This option has been added to allow for the setting of an existing folder. Navigate into the selected folder and select this option. Note that the last 2 options are only visible if you set the option "Copy smb playlist to Share" to ON.